ABSTRACT DIGITAL ART. Digital sphere in brick red, silver, and platinum. ABSTRACT DIGITAL ART. Three dimensional clay stripes in badns of dark blue grey and pale neon green. 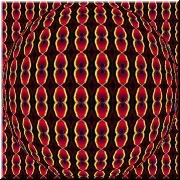 Enamelled grid (rose, purple and gold). DIGITAL ART. A curved enamelled metal grid in shades of rose, gold, and purple. Very unusual 3D effects. ABSTRACT DIGITAL ART. Rainbow glass (in two separate designs). A wheel surrounding a star. Grey stone cross with red and white flower. 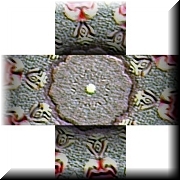 DIGITAL CROSS. Grey stone "ribbons" from a cross with a "stone" texture and red and white accents. A mosaic with a handcrafted rather "antique" appearance. I made a lot of these; I was getting tired of patterns based on circles or spheres. ABSTRACT DIGITAL ART. Floating planet; black network patterns in faded gold. Butterflies, crescent moons, and stars. ABSTRACT DIGITAL ART. A mosaic of gold metallic butterflies. Wheel in silver and gold. DIGITAL MANDALA. An image in woven silver "paper" with a metallic gold center.